Home Asia Family Singapore Videos Ah Pete to Man?... The GV Great Movie Race! Ah Pete to Man?... The GV Great Movie Race! November 24th, 2012, will go down as a memorable day for a variety of reasons... it was the day that Sammi and I competed as a team in the GV (Golden Village) Great Movie Race, as well as the day that I competed for the screaming fans with the cast of 'Ah Boys to Men' and it was also the day that I learned that I cannot trust someone who says, "it's not that physical - looking at everybody here, it won't be too challenging". All pictures in this article are courtesy of GV and OMY. The video is courtsey of OMY (watch the vodcast at the bottom of this article). It was a bright Saturday afternoon when Golden Village (GV) held its first movie-themed race, known as "The Great Movie Race" at City Square Mall. 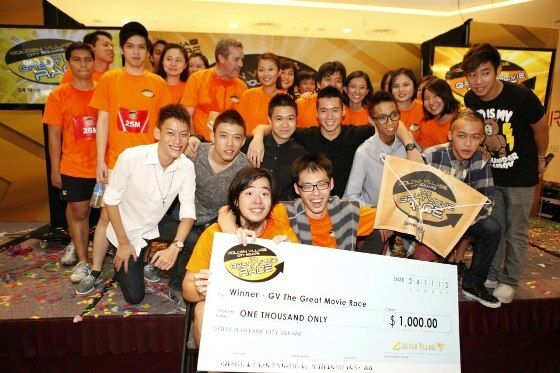 The race was part of the opening of the 11th Golden Village multiplex at the mall. 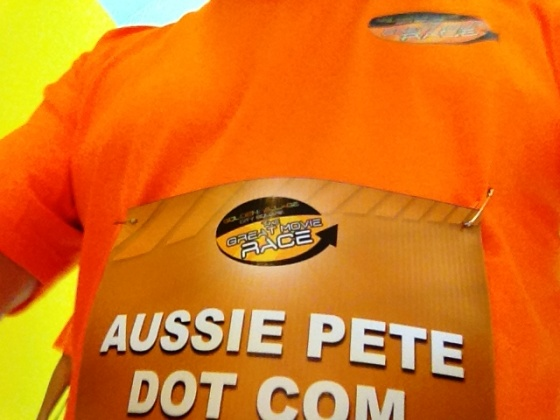 My wife Sammi (Zheng Liang) and I formed the OMY media team (aptly named "Aussie Pete Dot Com") and were the tenth team of finalists competing on the day. Although we didn't win, we certainly learned all about our stamina limits in this 'Amazing Race' style competition, which proved much more physical than intellectual. 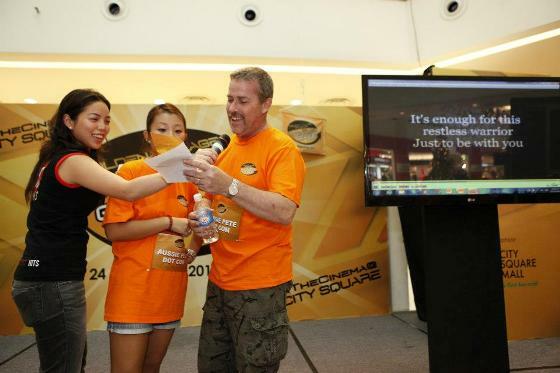 The other finalists were shortlisted from over 500 participants to compete in various tasks, including running 2.4 kilometers on a treadmill, guessing ice-cream flavours, a tug-of-war, archery and even testing ourselves in a karaoke version of 'Don't forget the lyrics'. The various pitstops wera all based around movie themes - well-known box-office hits such as "Indiana Jones", "Ice Age", "Ah Boys to Men", "The Hunger Games", "Sherlock Holmes" and many others. Sammi and I were actually extremely competitive (we smashed the poor girls who came up against us in the tug of war - their combined weight was probably 20kg less than my individual mass), and more than once my wife proved that she is definitely the 'better half' by out-performing me - surprisingly, she ran much further and more efficiently than me in the 2.4km run and was the only one in our team who knew the words to Elton John's smash hit, 'Can You Feel the Love Tonight'. The problem for us kicked in at the 3rd pit-stop (at Amore gym - the location of the treadmill run). 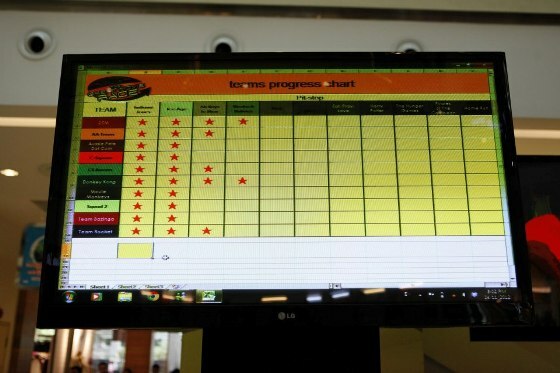 We checked in in 6th postition, and given that only five treadmills were utilized for the event, we could not start until one of the first five tems had completed this mini-marathon... putting us a full 10 to 15 minutes behind the leaders, that we could never make up... although we did almost catch up at the food court pice challenge, where we checked in before the race leaders had checked out. 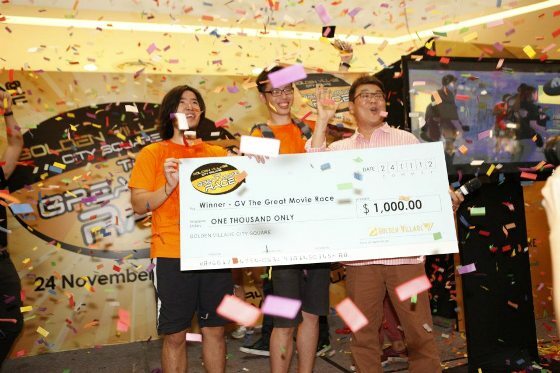 Also, a huge congratulations to students Sherman Ho and Gan Chong Zhi (both 23 years old), who checked into the final pitstop first and scored around $2,350 worth of cash and prizes. Well done guys! !